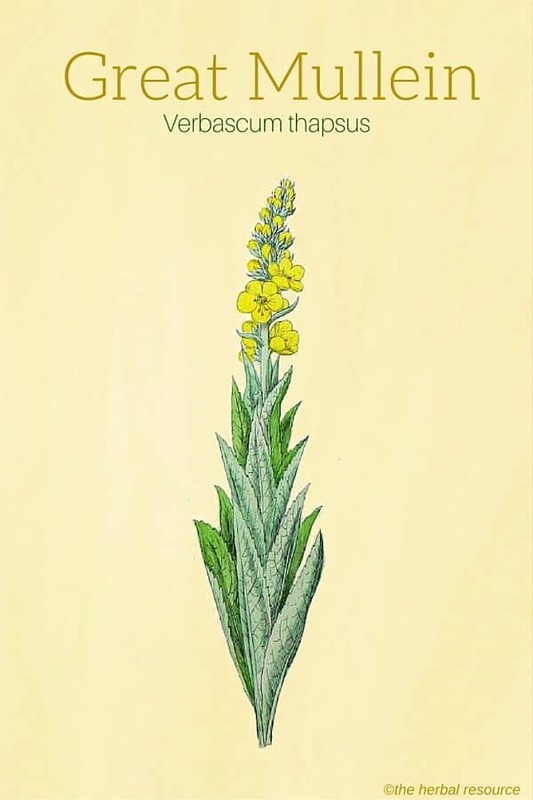 Botanical Name of Great Mullein: Verbascum thapsus. Other Common Names: Common mullein, Aaron’s rod, Adam’s flannel, feltwort, Jacob’s staff, old man’s flannel, blanket leaf, bullock’s lungwort, cow’s lungwort, hare’s beard, lady’s foxglove, ice leaf, Peter’s staff, shepherd’s club, candlewick, flannel leaf, flannel mullein, flannel plant, hedge taper, Indian tobacco, Jupiter’s staff, torch-wort, velvet dock. Habitat: Mullein is native to Europe, northern Africa, and Asia, and has been introduced medicinally to the Americas and Australia. It has the ability to grow in a vast range of habitats but prefers well-lit and disturbed soils, helping to enable its appearance soon after the ground receives light. 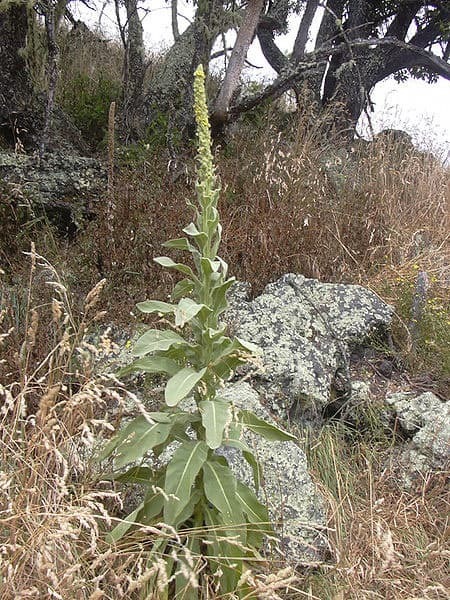 Plant Description: The mullein plant can grow to a height of about 7 feet with leaves that grow as large as 50 cm long. The pale gray leaves are covered with silver and felt like hairs. The flowers are yellow by nature and occupy approximately half of the stem. Mullein flowers from November through March and is considered by many agricultural businesses to be a weed and more of a nuisance than anything. Plant Parts Used: It is the mullein leaves and flowers that are used medicinally. Fresh mullein leaves are also used for the purpose of making a homeopathic tincture. Oil is made from the leaves and flower for medical purposes. 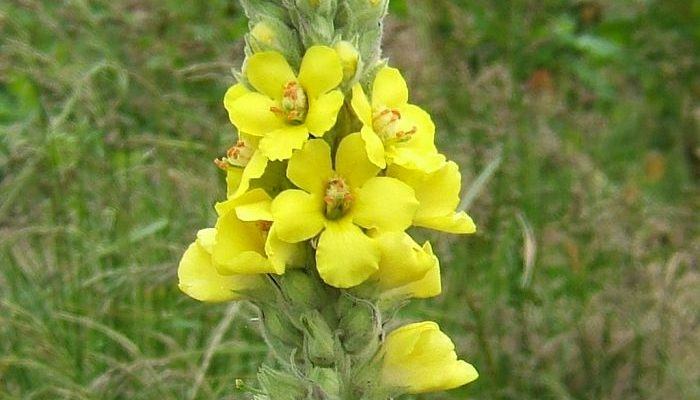 Great mullein contains a demulcent, emollient and astringent properties making it useful to help resolve pectoral complaints and bleeding of the lungs and bowels. Its uses can be traced back to the Greek herbalist, Dioscorides, who was one of the first to recommend it for in curing a variety of lung diseases. Various Native American tribes used great mullein to help cure chest diseases. One such example is by the Navajos who would mix it with tobacco and smoke it to relieve coughing spasms. The Mohicans, however, would mix it with molasses, making a tea and use it as a cough medicine. Great mullein has a very long history as an herbal remedy and in the Middle Ages was regarded as a cure-all. Its focus is that of curing cough and sore throats. Mullein contains antiseptic agents and is mostly used today for chest ailments including bronchitis, asthma, pneumonia, pleurisy and whooping cough. Recommended uses include that as a general pain reliever. The oils destroy disease and germ infections. Insomnia has also been a noted ailment for which mullein can be taken to aid in. This is caused by the high content of mucilage and saponins. Verbascum is an expectorant, meaning it is used to expel mucus from the lungs and throat; a demulcent, meaning it has soothing elements and reduces inflammation; a vulnerary, meaning it aids in the promotion of cell growth and repair; and an anodyne, which is a pain reliever. 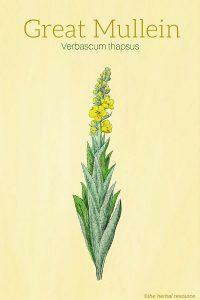 Infusion of the oils of the mullein flower can be used to create drops to help earaches. This infusion is a very strong antibacterial agent and is also extremely effective in the treatment of mouth and gum ulcers. The root is commonly used to relieve pain from cramping, toothaches, and convulsions. Alternatively it can be used effectively as an herbal remedy for migraines when accompanied by ear oppression. Poultices of the great mullein plant leaves have shown to help with hemorrhoids problems and said to be very valuable in the aid of diarrhea due to its combination of demulcent and astringent properties. This combination not only provides relief but is shown to strengthen bowels at the same time. It is these same properties that make mullein of great use for bleeding of the lungs and the bowels. The entire mullein plant itself basically possesses sedative and narcotic properties. The most commonly known way to effectively ingest mullein is by creating a simple tea from the leaf. This method is very effective as long as it is carefully strained through something of a very fine mesh to weed out the soft velvety hairs previously mentioned. The leaves may also be dried out, crushed, and then smoked to help relieve congestion due to hay fever or other respiratory distresses. Mullein is mainly beneficial and contains the following active compounds: Mucilage, flavonoids, triterpenoid saponins, volatile oils, and tannin. However, the seeds also contain rotenone and coumarin which are considered and named as dangerous by the FDA.